Buffy’s back, and she seems to be returning to her roots by joining up with the gang to get their slay on. Ah, if only it could stay so simple, but I know it won’t. However, with my new approach to the series, I’m looking forward to hopefully a happier reading experience. This season, I’m going into the comic with a new attitude. For years I’ve been frustrated over Buffy’s actions and her disregard for others. But I kept holding out hope that she’d wise up and get better. But no more! I’ve finally decided I just don’t care about her outcome as much as I do everyone else’s. Spike, Willow, Xander and Dawn, Billy and Devon, and now Mini!Giles are all in the immediate storyline and I care about them greatly. I will revel in their storylines and rejoice when they get interesting dynamics to deal with. 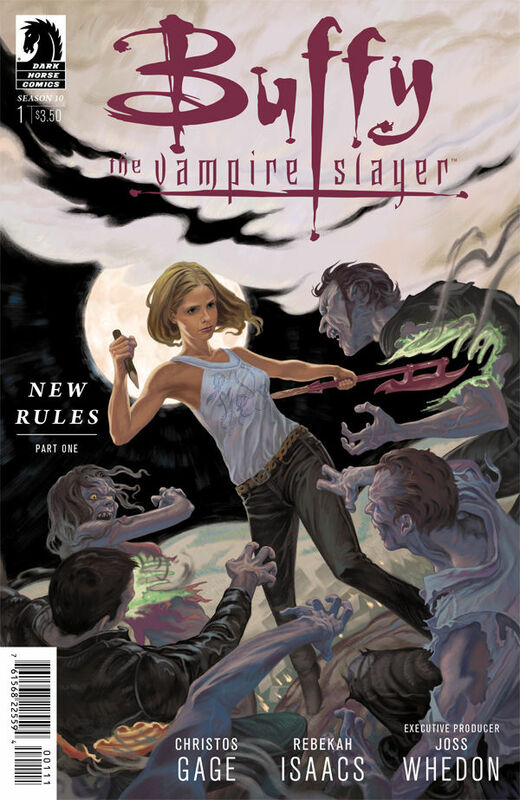 Buffy and the gang are battling zompires, cleaning up the streets from the undead. 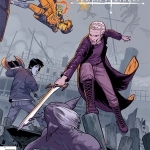 And the straight-line vampires seem to be on their side, too, standing with Buffy and the others to fight against the zompire creatures. Their leader, Vicki, even comes back later to help out in a zompire showdown. Seems to be a good thing, right? Yeah, not so much. Appearances can be deceiving and Vicki’s appearance is definitely in that category. She and her friends are no ordinary vampires. Instead, they have hidden powers that allow them to exist in the sunlight, to turn into mist, bats, night panthers. These powers are reminiscent of the Japanese vampires who stole Dracula’s powers, but these creatures are much stronger. This is an all-new kind of bad. But Buffy will not have to fight against them alone. The whole gang’s out to play. Willow is coming into her new powers, learning how to function again. Andrew’s helping out with the game plans, along with Billy and Devon, who I am happy to see again. Xander and Dawn are finding their way back together again, though their relationship’s a bit delicate. He’s even resorted to conferring with Ghost!Anya, though I’m not sure if that’s a sign of mental instability or not. I hold out hope that Xander and Dawn will persevere and become stronger together. Even Spike’s looking pleased and well-adjusted, though I don’t quite understand why. He and Buffy seem to have found a happy medium, working together and perhaps having a healthy relationship? How that happened I’m not sure, since this is the woman who keeps breaking his heart and stomping all over it. I’d love for them to be happy together, but I don’t want Spike to forget the badness that happens when they’re not. To round out the feeling of “all is right again”, Faith returns to the scene with a very special kid tagging along. That’s right, Mini!Giles is in the series again. And now Buffy, Willow, and the rest know that he is not quite as dead as they thought. Perhaps a bit smaller, but still just as snarky and powerful. He’s going to be a worthy ally as they step into this new adventure. With all these wonderful characters up for the task, I’m looking forward to how they play well together. Or how they might not. You never know with this group.